Sunday, August 3, 2014 4:00PM CST: Team TxSpeed.com with driver/team owner Jay Matus are heading back to Texas after its first debut in Pro-Racing with Pirelli World Challenge (PWC). Team TxSpeed.com pays high compliments to PWC and all the people dedicated to making these events happen: the personnel, the participants, the series sponsors and the fans of Pirelli World Challenge are first rate based on the experience of Team Tx Speed. Matus has been chasing down cooling problems ever since arriving at Mid-Ohio Sports Car Course and unfortunately those problems re-materialized during round 12 of PWC. However, true to the winning drive of Matus, he overtook several of his GTS competitors and had his sights on how to continue to gain position when the #71 Porsche had a mechanical that forced the end of the race for Team TxSpeed. Matus and his Team have a Championship spirit and head home with thier sights on resolving the mechanical challenges they have been facing. They come away from the PWC event with a solid showing and The Optima Battery Best Standing Start Award for Round 11 of Pirelli World Challenge. Keep checking Facebook for more updates on what is next for Matus. Saturday, August 2, 2014: Success for Porsche Race Team TxSpeed.com Racing and Driver Jay Matus at first Pro-Race in Pirelli World Challenge. We debuted at Mid-Ohio with PWC receiving the Optima Battery Best Standing Start Award by passing 7 competitors in the first lap of the race. Team TxSpeed had been chasing mechanical issues since arriving on Thursday and was unable to get much pratice and missed qualifying. So, Matus started in last position in a field of 52 cars. The team was very proud of Matus because of overtaking several drivers in the first lap and finishing the race with no damage as several accidents occurred at the beginning of the race and then later as the rain hit. Team TxSpeed is looking forward to Sunday’s race. Stay tuned for more details, photos and video. 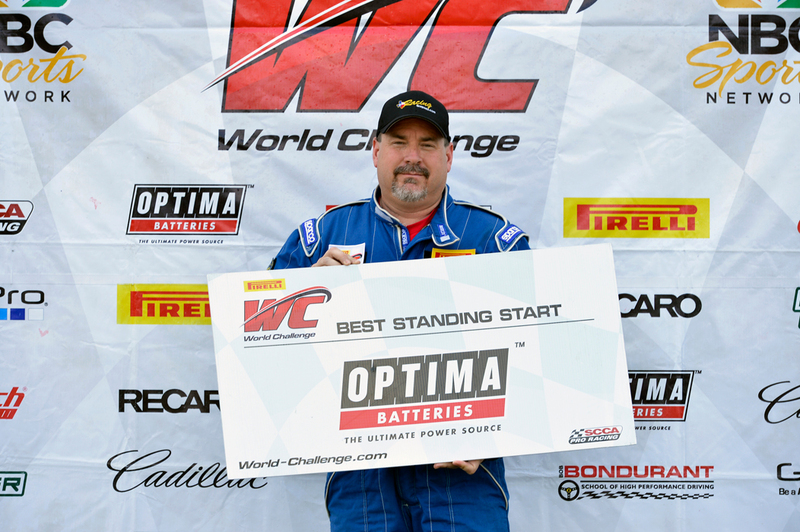 Congratulations Jay on your Optima Battery Best Standing Start Award! You can watch PWC Round 11 HERE and PWC Round 12 HERE.